I used a tool called the Scientific Method, that scientists use to derive an explanation for an observation or group of observations. one has to start with facts (or observations). then, one can propose a number of models or hypothesis, which are treated equally. We can test each one in turn against the observations to see how well it fits. Exactly how the testing works will depend to a large degree on the observations, but normally one looks to the model to see what effects would have been produced were it to be true, then compares these predictions against the actual observations. If there is a high degree of correlation between the prediction and the observation, then the model may be a good one. If the correlation is poor, we assume that the model is not so good. Once the testing is complete, the model that shows the highest correlation becomes the working hypothesis. If, later, a new model is proposed, then it has to go through the same set of test as above. If it scores more highly than the current leading hypothesis, then the new model becomes the new working hypothesis, and the old one is discarded. Let’s see how this technique can help us with Shanksville. We must start from the observations as made on the day and ignore (for now) any opinion or “explanation”. We start by looking at photos taken on the day (Figures 1, 2, 3). Next, we can propose some models to explain the photos we see. The first model is the idea that the crater we see in the photos was caused by an airplane crash. For brevity, I will call this the AM model. The second model is the idea that the crater was caused by some kind of explosive device: either a bomb (perhaps in a vehicle), or a missile (perhaps fired from a plane). Again, I will refer to this as the BM model. The next thing to do is find out what a plane crash and a bomb crater look like. You can see a typical airplane crash site (Figure 4) and a typical bomb crater (Figure 5). We can see that the AM would predict a large crash site containing an airplane, while, conversely, the BM would predict a small site containing very little. So it would seem at first glance, that BM shows closer correlation than AM. But let’s not jump to any conclusions yet, but, instead concentrate on the Method. Let’s have a look at some news coverage from the day. Have a look at this link, but please ignore (for now) the conjecture being offered by the “reporters”, and just concentrate on what you can see. Now have a look at this one. What we can see in these clips corroborates what we learned earlier and further supports the BM. When we move on to eyewitness testimony, we encounter our first problem. Sometimes eyewitnesses will tell you what they saw and heard, but sometimes their testimony is swayed by what they see and hear through the media after the event. Have a look at this interview. Again, try to ignore the opinion and conjecture here and just listen to what is said by the witness. Obviously this interview was conducted well after the event, so let’s look at some more testimony taken at the time. Local coroner Wallace Miller, one of the first people to arrive, said that the crater looked "like someone took a scrap truck, dug a 10-foot ditch and dumped all this trash into it." He expressed surprise that there were no bodies and no blood. “It was as if the plane had stopped and let the passengers off before it crashed”, he said. Frank Monaco of the Pennsylvania State Police said that the site looked "like a trash heap." He said that there was "nothing but tiny pieces of debris. It's just littered with small pieces." He went on to say that "it didn't look like a plane crash." Scott Spangler, one of the first photographers on the scene, said, "I was looking for anything that said tail, wing, plane, metal. But there was nothing, just this pit. I didn't think I was in the right place." Lastly, FBI agent Wells Morrison, the crash site commander, said his first thought upon reaching the scene was: "Where is the plane?" He said: "Most of what I saw was this honeycomb looking stuff, which I believe is insulation or something like that. I was not seeing anything that was distinguishable either as human remains or aircraft debris." We can go on gathering evidence like this and testing it against AM and BM, but I think we have done enough for now to get the picture. More importantly, I hope that we have done enough to illustrate how the Scientific Method works. This latter point is the more important, because once one is familiar with the Method, one can use it again and again. Remember that the most important thing is to establish the facts first. Only once the facts have been established can we go on to propose our models and test them. Inan unscientific method, , we start from the “conclusion” that an airplane crash was the cause of the incident. A proponent might say that he or she “knows” the cause because it was on the TV. When an opponent presents them with evidence that contradicts the proponent’s belief system, they might refuse to listen to the evidence and demand, instead, that the opponent first disprove the theory that came from the TV. In some cases they might try to belittle the opponent by claiming that they are not familiar enough with the TV narrative, or NIST report (“But how can you disprove my holy book if you haven’t even read it?”). This may be accompanied by ad-hominem attacks on the opponent with cries of “Conspiracy theorist!” (“Heretic!”), along with a display of anger . After this normally comes attempts to “explain” away the evidence. In the case of Shanksville, when it was put to the government that no wreckage was found, they claimed that the speed of the crash had been so great that the ground had “swallowed up” the airplane. The second anomaly is the discovery of patches of “wreckage” in other places. A part of an engine was discovered a third of a mile away, a portion of landing gear was nearby and some clouds of “light wreckage” (paper and ripped up seat backs) were found at three and eight miles from the site. Carol Delasko, who worked at a nearby marina, said the cloud of confetti-like debris she saw over Indian Lake had been "rising about 200 feet into the air" around the time the incident occurred. The fact that the cloud was rising would seem to suggest that it started on the ground and was blown up, rather than starting in the air and falling down. Again, the most likely explanation is that this material was planted. These anomalies don’t immediately seem to fit into either AM or BM and so would make excellent subjects for future research. Using the Scientific Method we never assume that we have reached the ultimate solution, just the best solution that is available at the time. We always keep our minds open to new evidence and new research. I think you’ll agree that this is a better approach than simply burning people at the stake. 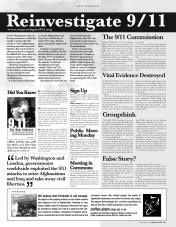 What's wrong with the 9/11 Commission? What do 9/11 survivors and 9/11 eyewitnessess say? - 9/11 - it's in the past, why go on about it now? - why call for another investigation? - How come fighter jets were not sent to shoot down the hijacked planes? Many films, including Anatomy of a Great Deception (20m views worldwide) with an introduction by its maker David Hooper. March for Homes, Health, Jobs, Education | End Austerity Now | Cameron Must GO! 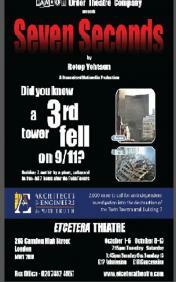 Richard Gage is the founder of Architects and Engineers for 9/11 Truth. 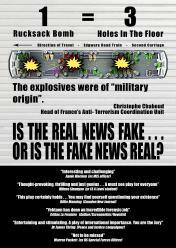 Fran Anderson on the 9/11 anthrax attacks which came not from "Al Qaeda" but from within the US military as confirmed by the FBI. 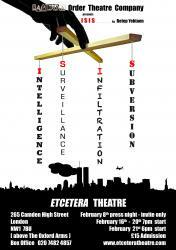 "INCONTROVERTIBLE" A new 9/11 Film by Tony Rooke. 7.30pm Whirlerd Cinema, Loughborough Junction, railway arches, Brixton. 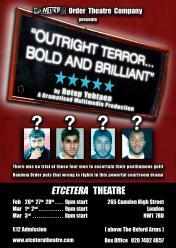 book tickets soon as this is selling out fast! Tickets £6.00 Can ONLY be bought via www.killingauntiefilms.co.uk. Speakers: Dan Glazebrook, Sukant Chandan, Tony Gosling, Ian Henshall and others TBC. Picket outside BBC, 12 Noon, at BBC House, Portland Place, Marylebone, London W1A 1AA. Architects and Engineers For 9/11 Truth founder member from America, Richard Gage, Architect on why the official 9/11 account cannot be correct as it contradicts the laws of physics and known architectural norms re: the collapse in particular, of WTC7 The THIRD TOWER to collapse yet it was NOT hit by a plane. 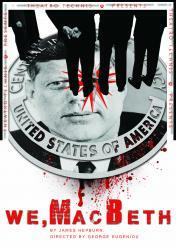 The play "We Macbeth" returns to Theatro Technis, Crowndale Rd, London NW1. Tel: 02073876617 for tickets. Sept 16th 2014 - 9/11 Anniversary Event at Conway Hall. Brockway Room, Conway Hall, London. 6.30-10.30pm. Tickets at the door, refreshments available thanks to Coffee Plant, Portobello Road. Prof Niels Harrit At Bilderberg 31st May 2014. Prof Niels Harrit gives a speech about wars and terror, and lack of scrutiny of those in power, by the mainstream media. David Rockefeller quoted as bieng grateful to a list of media outlets for being discrete and not reporting on the existence of Bilderberg meetings for over 40 years. Theatro Technis, in Camden, North London. November 1963, sinister elements of U.S. Government assassinated President Kennedy in broad daylight in Dallas. The men who accomplished this, never relinquished the power they gained from it. Here for the first time - in "We, MacBeth" - these men explain their motives and defend their values. 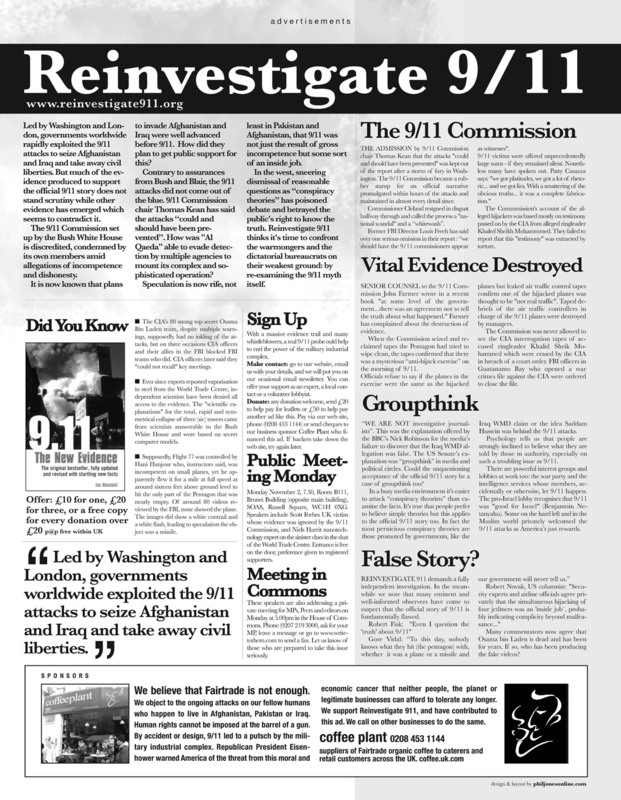 Comparisions to the effect of 911 will be alluded to. "911 - why is it Still relevant today?